Ed Kachurik was born in Pittsburgh, Pennsylvania, on April 2, 1957. He began working with hot glass in 1978. Ed has been creating his glass sculptures for more than two decades and continues to reach deep within himself to design new creations of art. He attended Penland School in North Carolina and Pennsylvania State University. Ed has taken the technical aspects of his studies at Penland School and combined them with his innate talent to create beautiful sculptures, which are seen in galleries and museums throughout the country. 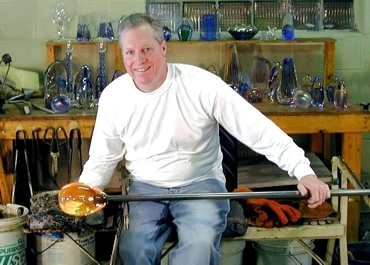 Ed Kachurik uses a technique of treating the hot glass surface, which is called veiling. Veiling is a metallic coating that is applied to the hot glass, and then covered with clear glass, thus trapping the color inside the sculpture. Kachurik is an independent glass artist who experiments with precious metals and chemicals to create his own unique colors. These transparent sculptures maximize the extraordinary inherent qualities of glass. Every design is handcrafted using wooden blocks and newspaper to help him work with the molten glass. After the sculptures have been annealed, they are hand ground and polished. Each flat surface of the sculpture must go through six different steps of polishing to achieve the optical polished finish. The facets are added to give visual enhancement to the interior glass veiling. Each piece is personally signed.